Ever read On the Road? Or seen Tommy Boy? This is just like that, but with Spider-Man and Deadpool. The two red-clad heroes are traveling across America, discovering their country and true friendship - and just like every other great road trip, this one ends up in the Negative Zone! Our heroes are way out of their element - and need to get the heck back to their world pronto, or they'll miss the rampaging bug monsters laying waste to the Marvel Universe! But the Negative Zone-threat known as Blastaar the Living Bomb-Burst doesn't care about any of that. One thing's for sure: Spidey and Deadpool can't face this threat alone. They're holding out for a Deviant hero! 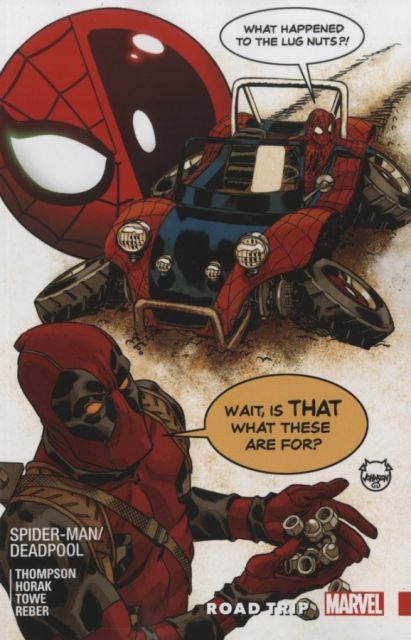 Collecting SPIDER-MAN/DEADPOOL #41-45.